Second of the Seven Days� Battles. Gen. Robert E. Lee initiated his offensive against McClellan's right flank north of the Chickahominy River. A.P. Hill threw his division , reinforced by one of D.H. Hill's brigades , into a series of futile assaults against Brig. Gen. Fitz John Porter's V Corps , which was drawn up behind Beaver Dam Creek. Confederate attacks were driven back with heavy casualties. Jackson's Shenandoah Valley divisions, however, were approaching from the northwest, forcing Porter to withdraw the next morning to a position behind Boatswain Creek just beyond Gaines� Mill. Report of Maj. Gen. George B. McClellan, U. S. Army, commanding Army of the Potomac. 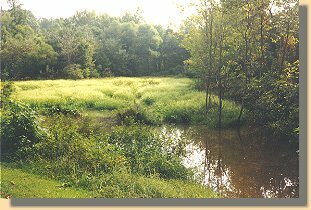 The position of our troops was a strong one, extending along the left bank of Beaver Dam Creek, the left resting on the Chickahominy and the right in thick woods beyond the upper road from Mechanicsville to Cold Harbor. The lower or river road crossed the creek at Ellison's Mill. Seymour's brigade held the left of the line from the Chickahominy to beyond the mill, partly in woods and partly in clear ground, and Reynolds' the right, principally in the woods and covering the upper road. The artillery occupied positions commanding the roads and the open ground across the creek. Timber had been felled, rifle pits dug, and the position generally prepared with a care that greatly contributed to the success of the day. The passage of the creek was difficult along the whole front, and impracticable for artillery, except by the two roads where the main efforts of the enemy were directed. At 3 p.m. he formed his line of battle, rapidly advanced his skirmishers, and soon attacked our whole line, making at the same time a determined attempt to force the passage of the upper road, which was successfully resisted by General Reynolds. After a severe struggle he was forced to retire with very heavy loss. A rapid artillery fire, with desultory skirmishing, was maintained along the whole front, while the enemy massed his troops for another effort at the lower road about two hours later, which was likewise repulsed by General Seymour with heavy slaughter. The firing ceased, and the enemy retired about 9 p.m., the action having lasted six hours, with entire success to our arms. But few, if any, of Jackson's troops were engaged on this day. The portion of the enemy encountered were Chiefly from the troops on the right bank of the river, who crossed near Meadow Bridge and at Mechanicsville. The information in my possession soon after the close of this action convinced me that Jackson was really approaching in large force. The position on Beaver Dam Creek, although so successfully defended, had its right flank too much in the air, and was too far from the main army to make it available to retain it longer. I therefore determined to send the heavy guns at Hogan's and Gaines' houses over the Chickahominy during the night, with as many of the wagons of the Fifth Corps as possible, and to withdraw the corps itself to a position stretching around the bridges, where its flanks would be reasonably secure, and it would be within supporting distance of the main army. General Porter carried out my orders to that effect. Beaver Dam Creek, January, 1998 (left) and September, 1998 (right). 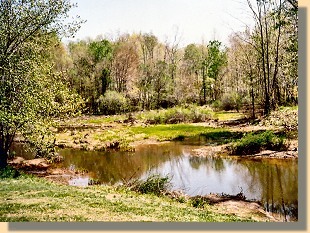 Beaver Dam Creek, Spring, 2005. 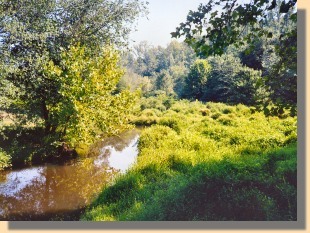 Beaver Dam Creek, Summer, 2008. The four photographs above were taken at the same location ("A" on the map, above) from different directions. They show one of the places the Confederates crossed Beaver Dam Creek under intense enemy fire.